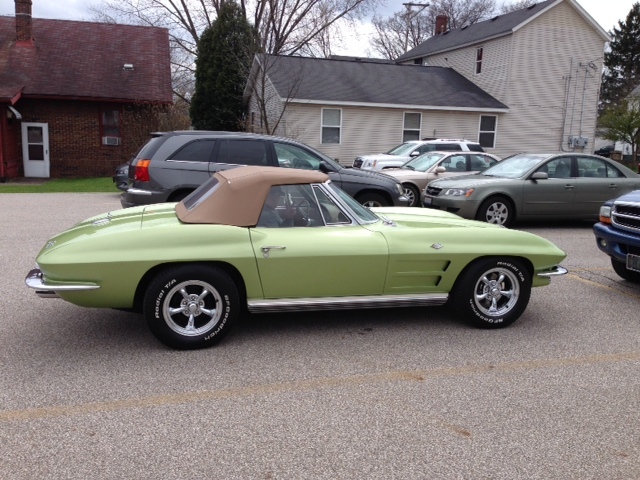 1964 Corvette Stingray Convertible. 327, 300HP, 4SP,, non-matching numbers. Excellent driving condition! New tires, mag wheels, carpet interior. Three year old convertible top-no hard top. New 'Wilwood' front disc brakes, new 650 Holley carb, plugs, custom steering wheel (still have original), MSD ignition, Taylor plug wiring, updated CD/Radio, custom fitted in dash (still have original 'Wonder Bar Radio'), new speakers front/back. Chrome is in excellent condition. Frame excellent condition-no rust. Interior good to excellent condition. Approximately 20,000 miles on current motor. Additional photos gladly provided upon request. Asking $48,000. Serious inquiries only, please.